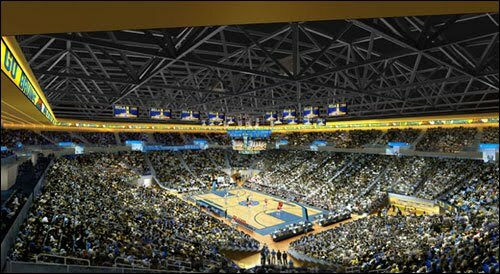 Green SoCal: Linkage: How Green Will Pauley Pavilion Be? There is a celebration planned this Tuesday on the UCLA campus in Westwood to kick off the renovation of Pauley Pavilion. The good news is that the long overdue update of this legendary arena is going to cost almost $50 million less than initial estimates (LA Times). "The arena will also be built with environmentally friendly features, such as a white roof, low-flow plumbing and low-water-use landscaping, which should make it eligible for a LEED-Silver rating from the U.S. Green Building Council, (Vice chancellor of finance, budget and capital programs Steve) Olsen said." That sounds encouraging. But the greenest development that can happen has nothing to do with the renovations at Pauley Pavilion, but the mode of transportation people use to attend the events there. Pauley Pavilion could be the greenest arena on the planet, but if the majority of Bruins basketball fans drive to the game in carbon-emitting cars, then it doesn't matter. It is another reason why extending the subway to Westwood through the Measure R 30-10 plan is so vital. Tuesday, May 11 at 1 p.m.
Wednesday, May 12 at 8:30 a.m.